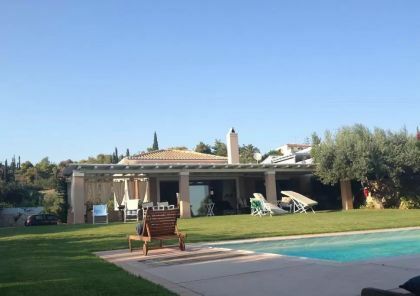 Private villa for rent boasts its unique position – just at the beach, surrounded with great natural landscape among pine trees and provides amenities for guests of all ages to entertain and relax. 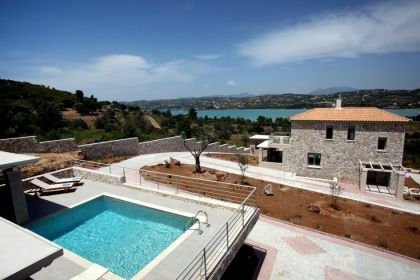 Villa is tastefully decorated in a modern style with some traditional elements. Large spacious interiors with great sea views and luxury amenities guarantee that every guest will be satisfied with their holidays here. 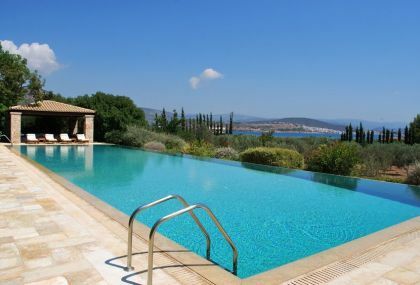 Villa offers 6 bedrooms, 5 bathrooms, a well-equipped kitchen with microwave and cooking facilities. The living room has sofas and TV. Air conditioning and free WiFi are offered. Guests can relax in the garden that also has BBQ facilities and an outdoor kitchen for al fresco meals. Outdoor dining areas are provided. Activities in the surrounding area include skiing, cycling and hiking. Epidavros is 47 km away. Free private parking is offered nearby.